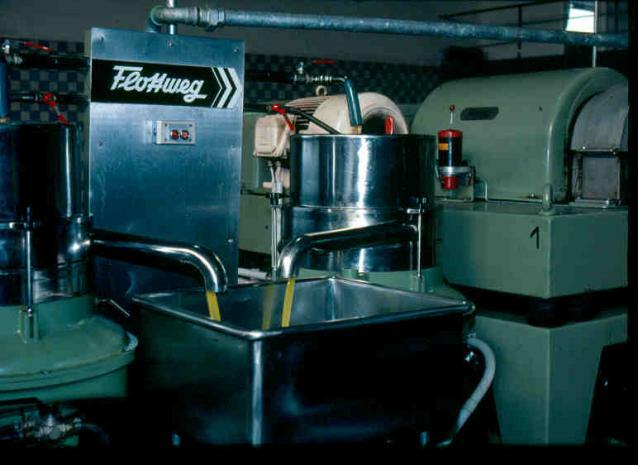 Olive oil extraction generates several by-products that can be used to feed animals, particularly the cakes and pomaces obtained from the extraction process, and leaves and other residues resulting from the cleaning operations. The young shoots coming out from the base of the tree can be browsed by sheep and the olives themselves can be eaten by pigs in extensive systems, such as those producing the Jamón ibérico in Spain. Crude olive oil cake, obtained by mechanical extraction. This product contains residual oil and stones. Exhausted or defatted olive oil cake, obtained by mechanical and solvent extraction. This product contains stones and less residual oil than the previous one. Crude olive oil cake without stones, obtained by mechanical extraction and de-stoning. This product contains residual oil and no stones. Exhausted or defatted olive oil cake without stones, obtained by solvent extraction and de-stoning. This product contains little residual oil and no stones. 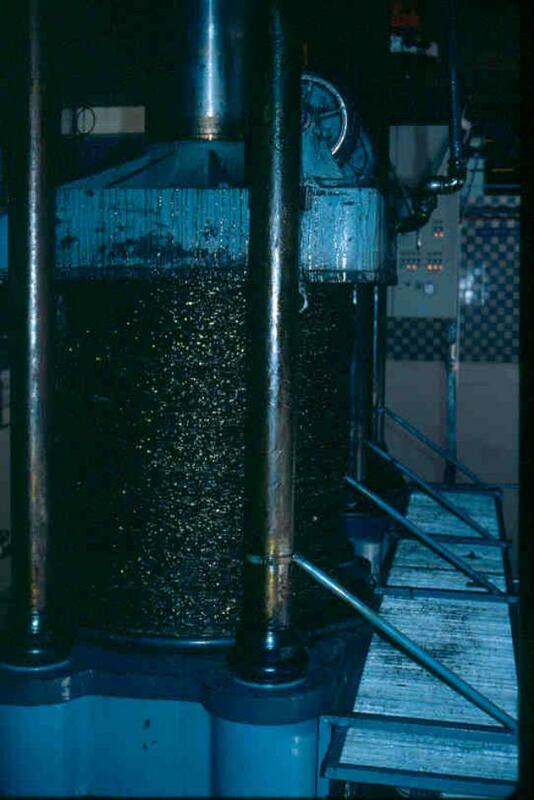 Olive oil pulp, obtained after stone removal followed by mechanical extraction. Exhausted olive oil pulp, after stone removal and solvent extraction. Olive oil vegetation water (“black water” or alpechin), obtained by centrifugation or sedimentation of the oil. This sugar-rich product is sirupy, black and bitter with a distinctive odour due to polyphenols and other substances. It can be (partially) dried, resulting in a molasse-like product. Mechanical extraction of olive oil yields about 33% (with 24.3% water) crude olive oil cake while solvent extraction yields 25% exhausted olive oil cake and 17% water. The yield for fat olive oil cakes is about 40-55% in the 3-phase extraction process, and up to 80% in the 2-phase process (as olive oil cake still contains water) (Molina Alcaide et al., 2008; Sansoucy et al., 1985). After oil extraction, the crude or defatted cake may be de-stoned. The defatted, de-stoned oil cake is the most frequent product. The average yield of de-stoned olive cake is about 50% but varies greatly (Eraso et al., 1978). 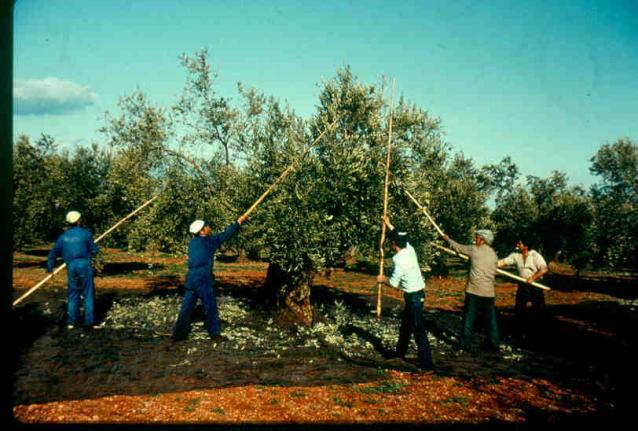 The Acapulco or Enfida process consists in de-stoning olives before extraction, resulting in a crude or defatted olive pulp (Nefzaoui et al., 1978). The Mediterranean countries produce 98% of olive oil worldwide. Spain, Italy and Greece are the main producers (75% of the total production). The demand for olive oil has increased a lot since the mid-1990s and olive oil production in 2009 was almost twice (2.91 million tons) that of 1995 (1.65 million tons) (FAO, 2010). Vegetation waters from olive milling are regarded as a severe environmental problem because of their high organic content consisting of poorly-degradable phenolic compounds that are both antimicrobial and phytotoxic (Ramos-Cormenzana et al., 1995). However, modern olive oil manufacturers usually use 2-phase centrifugation extraction processing methods that do not produce olive oil vegetation waters. Nutrient composition varies greatly between different olive by-products. This may be due to olive variety or environmental conditions: for instance, during dry years, stones may represent up to 70% of the fruit (Gómez Cabrera et al., 1984). 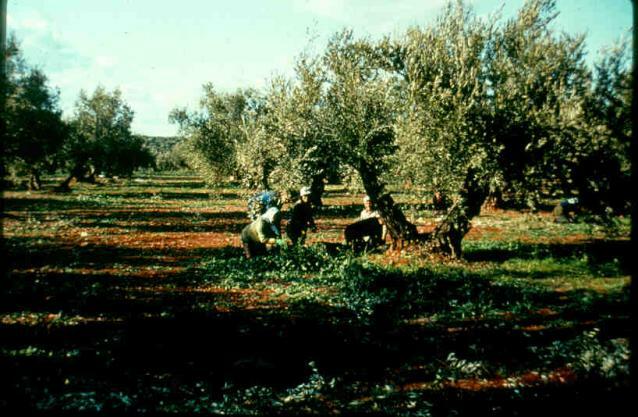 Mineral content depends on harvesting methods: 7-8% when the fruits are picked directly from the tree (Gomes et al., 1981), 11% when they are collected with a net, and 16-24% when the olives are dropped onto the ground before harvesting. However, these values are not usually found in olive oil manufacture since olives are washed before crushing. Crude protein, crude fibre and crude fat also depend on extraction method (2-phase or 3-phase process) as well as on the method of de-stoning (Molina Alcaide et al., 2008). Crude fibre is mostly constituted of lignin, which limits the feed value of olive cake (Amici et al., 1991). Crude protein content is low and it is worth noticing that most crude protein is linked to ADF. Moreover, solvent extraction increases N-ADF since olive oilcake is submitted to various heat treatments that cause a Maillard reaction (carbohydrate-protein binding). However, N-ADF content is lower in crude olive cake than in defatted cake (Álvarez-Rodríguez et al., 2009). Polyphenol and tannin content are also significant. As the cake rapidly turns rancid and may become completely unpalatable, and even harmful to animals, it must be preserved either by drying or ensiling. Olive oil cakes obtained from the 2-phase extraction process contain tannins, but they do not appear to have toxic effects on livestock. Sheep are more sensitive to olive cake tannins than goats (Yanez-Ruiz et al., 2007). The following table presents the different types of polyphenols and tannins in olive oil cake (Molina Alcaide et al., 2008). Olive cake is not very palatable to ruminants. It may be recommended to blend it with other stuffs: adding molasses to olive oil cake can improve palatability. Due to its high lignin content, low crude protein content and poor digestibility, olive oil cake may be compared to roughage and is well accepted by ruminants (cattle, sheep, goats and camels). Olive oil cake can be fed either fresh, ensiled, dried, included in pellets or multi-nutrient blocks (Molina Alcaide et al., 2008). It can be included at very high levels in ewe or goat diets (70%) in periods of feed scarcity to provide maintenance requirements. In fattening lambs, 40% inclusion is recommended (Nefzaoui, 1991). Olive oil cake has a positive effect on milk yield and milk fat content in cows and ewes (Molina Alcaide et al., 2008; Sansoucy et al., 1985). It also improves milk protein in ewes. Introducing olive oil cake, with high oleic acid content, in the diet of lactating animals enhances milk fatty acids quality, through increasing mono-unsaturated fatty acids and decreasing saturated fatty acids (Molina Alcaide et al., 2008). Crude olive oil cake and crude olive oil cake without stones have high nutritive values that depend on fat content. If the fat content is adequately balanced in the diet, crude olive cake has great potential in lactating cows or ewes since it increases milk yield (Molina Alcaide et al., 2008). However, fat rancidity is prone to occur and may become a problem. Preservation methods are thus necessary. Crude olive cake may be ensiled with agro-industrial by-products and/or animal wastes as it allows preservation without affecting palatability and nutritional value, which may be compared to that of barley straw or good quality hay (Hadjipanayiotou, 2000). Crude olive cake silage had no effect on milk yield but increased milk fat content in ewes and goats (Hadjipanayiotou, 1999). Silage made with olive cake and 8% sugarcane molasses, 0.4% formic acid and 0.5% urea gave promising nutritive values (reduced ADF content, higher DM degradability) (Rowghani et al., 2007). Exhausted olive cake mixed with olive molasses replaced sunflower meal and barley grain in ewes in late pregnancy, slightly improving ewe performance and carcass yields of their lambs (Aguilera et al., 1992). Feeding growing cattle on exhausted olive oil cake does not give such promising results as it may decrease live-weight gain in heifers and calves (Sansoucy et al., 1985). Exhausted olive cake treated with either 4% NaOH or 4% NaOH + urea increased weight gains and improved the feed conversion ratio. However, those treatments did not prove to be economically interesting (Sansoucy et al., 1985). The inclusion of olive cakes, even those with high moisture, into multi-nutrient blocks has proved promising as they may decrease feed costs by 18 to 38% (Molina Alcaide et al., 2008; Ben Salem et al., 2003). Overall olive cake degradability was reported to be low (32% after 72 h) (Nefzaoui, 1991). The DM effective degradability was as low as 37% or 42% (Álvarez-Rodríguez et al., 2009; Molina Alcaide et al., 2008). Effective N degradability is also very low (44%) due to high N-ADF. In both olive leaves and olive cake, the rumen degradability of amino acids is higher (75% and 90%, respectively) than that of CP (45% and 56%, respectively) (Molina Alcaide et al., 2008; Nefzaoui, 1991). Exhausted olive oil cake is even less degradable with a DM degradability as low as 12% (Álvarez-Rodríguez et al., 2009). Nutritive values appear to be higher in crude olive oil cake than in the defatted cake. Crude cake may nevertheless limit the global digestibility of the diet since its high oil content reduces rumen fermentation by increasing fat and free fatty acids content and its high polyphenol and lignin content inhibits fermentation (Álvarez-Rodríguez et al., 2009; Zaidi et al., 2008; Sansoucy et al., 1985). The destoned cake has been used to feed pigs in proportions up to 50% of a daily ration consisting of maize, wheat pollards and coconut cake. No digestive problems or decrease in appetite were observed, and live weight gain was normal; however, the feed efficiency tended to be somewhat lower. Cakes should not be fed to pregnant animals as piglet birth weight tends to be lower. The cake has a rather low palatability (Göhl, 1982). Broilers may be fed on olive pulp. A 10% inclusion level in the diet replacing maize gave the highest average live weights in starters and finishers and had no effect on carcass quality (Abo Omar, 2005). A 7.5% inclusion level was previously recommended (Rabayaa et al., 2001). Laying hens fed on olive cake at 9.5% in the diet gave similar egg numbers and quality as hens fed on maize (Al-Shanti et al., 2003). For rabbit feeding, olive oil cakes are a potential important source of fibre (50-70% ADF; 20-27% ADL) and lipids in various proportions (4-10%), depending on the industrial process: crude or defatted cake, with or without stone. The quantity of protein is low for an oil cake (5-13% DM) and the protein digestibility is very low: about 10-30% (Mehrez et al., 2011; Fernandez-Carmona et al., 1996; Martinez-Pascual et al., 1980). Only one study proposed a moderate protein digestibility of 67.2% (Leto et al., 1981). In addition to their low digestibility, the proteins are widely deficient in sulphur amino acids and lysine (Leto et al., 1981; Rupic et al., 1999a; Lanza et al., 2010). To study the incorporation of olive cake with stones (crude or defatted) in balanced rabbit feeds, the cake generally replaced a forage such as alfalfa or sulla (Ben Rayana et al., 1994; Chaabane et al., 1997; Leto et al., 1981). On the contrary, olive cake without stones, frequently named olive pomace, was introduced in place of a more energetic ingredient such as barley (Mehrez et al., 2011) or wheat bran (Dal Bosco et al., 2012). Crude olive oil cake or defatted oil cake with stones can be introduced safely at up to 20-30% of the diet in growing rabbits (Leto et al., 1981; Tortuero et al., 1989; Ben Rayana et al., 1994; Kadi et al., 2004). The only real health problem associated with olive cake use may be the presence of mycotoxins if the cake is not stored in good hygienic conditions after production (Kadi et al., 2004). However, the olive oil cake was used at up to 100% of the daily intake without any problems, demonstrating the absence of any intrinsic toxicity (Martinez-Pascual et al., 1980; Fernandez-Carmona et al., 1996). Nevertheless, independently of possible mould development during storage, the cake conditions of conservation may also have a negative incidence on the oxidation of residual lipids, thus also on the rabbit's meat oxidation stability (Dal Bosco et al., 2012). The presence of an important content of residual lipids has a significant influence on carcass quality. The proportion of oleic acid (C18:1), the main fatty acid of olive oil, is increased in the rabbit's abdominal fat and meat (Dal Bosco et al., 2012). Simultaneously, the proportion of the other fatty acids (mainly C14:0, C16:0, C18:0, C18:2 and C18:3) is reduced (Leto et al., 1981). When introducing similar quantities of olive oil in the diet, this type of lipids resulted in an "oily" aspect of the rabbit carcasses (negatively appreciated by consumers), but in blind taste tests, the meat was preferred to the other lipids sources sudied (Ouhayoun et al., 1987). 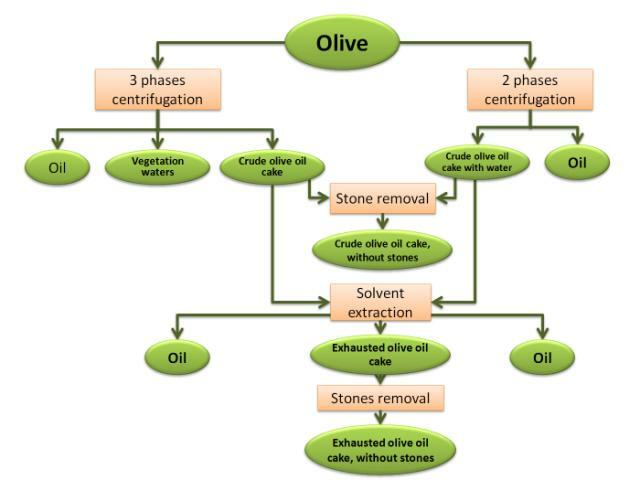 Olive stones result from the industrial olive oil process, or from the stoning of fruits for human consumption (Rodriguez et al., 2008). Olive stone meal is a coarse low-digested fibre source potentially useful in the prevention of digestive troubles in growing rabbits. Introduction of olive stones at up to 6% of the diet, with the same nutritive and fibre equilibrium, results in identical performance of growing rabbits for growth, digestive physiology slaughter or meat quality. The only significant modification of the digestive physiology is an increase of the butyric acid proportion (+10%) associated with a decrease of the acetic acid proportion (-2%) in the volatile fatty acids of the caecal content (Carraro et al., 2005). This modification could be considered as a safety factor for the digestive rabbit heath. Nevertheless economical interest of olive stone in rabbit feeding must be considered, in comparison with the other uses of this by-product: burnt as source of energy, or treated to provide specific chemical or physical products such as activated carbon, furfurals, biosorbants or abrasives (Rodriguez et al., 2008). In Saudi Arabia, locally produced olive waste was used as a substitute ingredient for wheat bran at up to 25% of the diet for tilapia (Oreochromis niloticus) without compromising their growth performance and efficiency of feed utilization (Al-Asgah et al., 2011). Sansoucy, R. ; Alibes, X. ; Berge Ph; Martilotti, F. ; Nefzaoui, A. ; Zoïopoulos, P., 1985. Los Subproductos del olivar en la alimentación animal en la cuenca del Mediterráneo. Producción y Sanidad Animal 43. FAO Roma (Italia) 46 pp.